Demand for weaned calves is growing and the cattle market is placing more emphasis on calves with a known management history. The overwhelming majority of Kentucky calves are weaned on the trailer on the way to the local sale barn. But research tells us that preconditioning calves can help reduce sickness and death loss by 74 percent, making them more valuable. The only date to bring in pesticide containers for the Rinse and Return Program will be Tuesday, September 3. As you spray your various pesticides this spring and summer, you are encouraged to properly rinse, store, and recycle them. 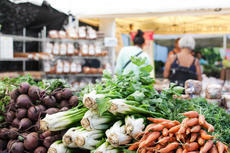 Spring is here and some exciting changes have been made concerning the 2019 LaRue County Farmers Market. Broomsedge is a native warm-season grass that can dominate poorly managed pastures and hayfields. While it has little value as a forage, it does provide good nesting habitat for birds such as turkey and quail. However, as a forage crop it definitely falls short. When it is found in pastures and hayfields it is often an indication that something is not quite right. In most cases it is related to low soil fertility and poor grazing management. Read on to discover some approaches to reduce broomsedge and promote desirable forages. Lawn care can be expensive and time-consuming. By skipping the fertilizer this spring and summer, you can save money and time and also reduce nutrient pollution. Most Kentucky lawns have cool-season grasses, such as bluegrass and tall fescue, which prefer fall fertilization. Spring and summer fertilizer applications could weaken your turf, promote weed growth and increase mowing frequency. Sow grass seed. First half of the month is ideal but you can seed all month with reasonable results. Turf type tall fescue is your best choice. Farm supply retailer Southern States Cooperative is holding a month-long fundraiser to help raise money for FFA at the local, state, and national levels. Southern States is holding its annual FFA Paper Emblem campaign throughout the month of March where customers can donate $1 or more at checkout and sign their name on an “I’m Supporting FFA” emblem that will be displayed in the store’s window. The Extension Office is currently taking booth reservations for the annual Extension Expo to be held in the LaRue County High School gym from 10 a.m. to 2 p.m. on March 16. Call the Extension Office at 270-358-3401 for more information. Novel endophyte tall fescue varieties have been on the market for about 20 years. Recently, the University of Kentucky released a novel endophyte tall fescue variety, Lacefield MaxQ II. It was available to producers in 2017 and is expected to be more widely available in future seasons.